This article proposes a design concept for the next generation of the present Fujifilm X-Pro camera. It maintains and builds on the existing classic control elements with mechanical dials and on the hybrid viewfinder, which can switch between the electronic (EVF) and optical (OVF) mode. It adds on the top side a small digital display which only extends and interacts with the existing mechanical dials in an intelligent way - not using PASM symbols. The display can be based on today available e-ink technology, which is better readable and more variable than a LCD. But this display overcomes three limitations of the existing design. First, to indicate plus control more settings for camera operation, which the pure mechanical dials connot when looking at the camera. This are active AF areas or manual focus distance, ISO or auto ISO, auto speeds or speeds beyond the mechanical range, the selected drive mode, RAW on/off, custom modes etc. Second, especially the combination of using the camera with the OVF and controling most settings with this power saving small display on the top plate will bring up battery life essentially. It may even become comparable to that of a professional DSLR. This can make a coming X-Pro2 outstanding from the rest of all mirrorless cameras, not speaking here about other advancements that can be expected from a new X-Trans sensor generation. 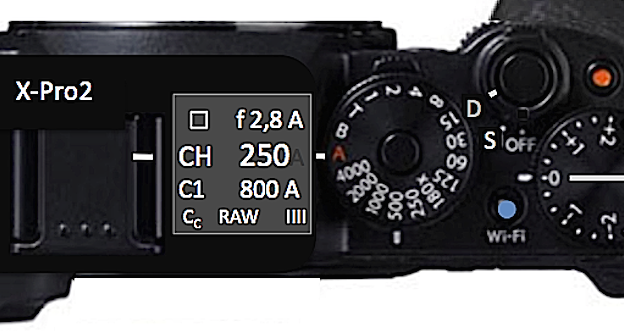 Third, the proposed display complements in a discrete way the given classic rangefinder design but is not interfering with it as an additional ISO dial would do.The ISO dial remains the domain of the X-T1 classic SLR design. Let me share here with you some possible design features of the new X Pro2, we are all waiting for. I assume, the reader already knows the rumored specifications as 24 MP APS-C X-Trans Sensor, 4K Video etc. You may click for this fujirumors.com. But this is not a wish list of additional specifications. I just anticipate here how Fujifilm may have transferred X-T1 features into the range finder design of a new X Pro2. And I anticipate also an i.m.o. realistic way, how Fujifilm could deliver one so much requested improvement for it’s present X-Pro1: longer battery life. A larger handgrip, incorporating a battery with slightly more capacity can help, but will not bring up battery life into DSLR territory. Why? All mirror less cameras are suffering under the fact, that usage of LCD screen and/or EVF drains battery too fast. Already the X Pro1 can deliver longer shooting intervals with only one battery charge, as long as use is made from the OVF only. But for setting up various camera menu options as ISO, drive options etc. usage of the rear screen was mandatory, which drains again the battery. I see Fujifilm could now deliver a mirrorless pro camera body, which – regarding battery life – can make a difference, narrowing the gap to the DSLR professional cameras and beating all mirrorless competitors as Sony A7, Leica SL etc. At the same time, Fuji can keep the weight for the body in the 450gr range, well below the values of it’s competitors. How? First, by keeping and improving the X-Pro hybrid viewfinder technology. This enables the photographer to make power saving usage of the OVF when shooting with lenses approx. between 18 to 60 mm. Within this range usually fall over 50% of all shoots taken. And although many of us have today a preference using a high resolution EVF, it is an extremely valuable feature to be able switching to the OVF. When? When your batteries have to last more than a single day, when being outdoor for several days. Second, by spending the new X-Pro2 a top panel (liquid crystal display LCD) as known from many pro DSLRS. Or, much better, as shown by the new Leica SL, a more contrasty black&white e-ink display similar to those implemented today in the e-book readers. The flat top plate over the viewfinder of a rangefinder body is well suited to accommodate such a display. Now, several camera menu options as the activated AF areas, selected ISO and drive options, film simulations, RAW on/off etc. could be made visible using only such a power saving top side display. This reduces essentially the time to switch on the more power demanding EVF or rear LCD screen. It is clear, LCD overlays inside the OVF can also indicate all or most of those options. But it belongs to the preferences of a pro shooting style: to check and modify main camera settings before shooting at a glance and modify most of them directly from outside. For the X-T1, this has been achieved by implementing mechanical ISO and drive selection dials. But this design also limits the options for multiple Auto ISO implementation. An X-Pro2 could – as many professional DSLRs – transfer the function for selecting such parameters to the top panel + Fn and/or scroll dial controls. In fact, this could generate a very elegant way, how to design and operate a new X-Pro plus reduce the drain of battery (suggesting Fujifilm did found a similar way), see Fig. 1. Fujifilm’s classic design with shutter dial and aperture ring around the lens avoids the PASM nomenclature. Instead it is a “triple A” design. 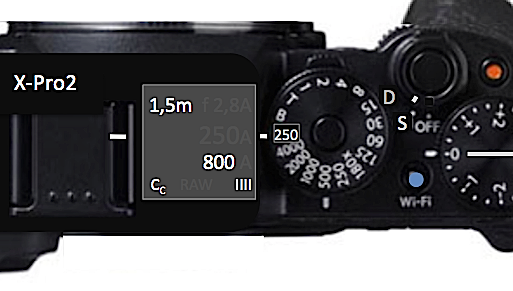 To operate a camera like the X-T1 fully automatic, aperture ring, shutter dial and ISO dial have to be in their individual “A” positions, each one separately. The disadvantage is, the photographer’s eye has to look at 3 different points of the body&lens combination. Instead, a top side display can indicate together with the shutter dial next to him „tripple A“ in a single position of the camera. On the display: „A“ for Auto Aperture mode and below „A“ for Auto ISO mode. On the shutter dial next to him „A“ for Auto Speed. See Fig. 2. A single mechanical Full Auto Switch, as implemented in the X-T10, which is focussed on the enthusiast user, I did not consider for a pro model. What are the most useful indications for a proposed top side display? See the legends below Fig. 2 and 3. They show the two opposite modes of operation. In Fig. 2: Full Auto (Program P + Auto Iso, which I describe here as „triple A“ plus one selected AF mode). Top left:   AF mode indicated– here e.g. Central AF (or Phase Detection Field etc.) Top right: F-stop indicated when lens in use with no aperture ring markings & or in A pos. In Fig. 3: All manual mode, keeping off on the display all indications which can be seen at the lens or shutter speed dial. Top left: set focus distance is indicated in manual focus mode                                                                                                         Top right: F-stop not indicated when lens in use with aperture ring markings & not in A pos. It is clear, that my description does not cover all possible options and all questions of good implementation. But I wish, Fuji has made for the new X-pro2 similar design considerations or surprises with an even more elaborated solution. Changing the Off/On switch around the shutter release button to select now between Off, S for Single and D for Drive. This kind of switch is known from Leica M or Q. In position “D” and in combination with the front or rear dial, the photographer selects now between CH, CL, Bracketing etc. The selected mode is indicated by the top side display. This permits to switch between single shot and the preferred/pre-selected Drive mode very fast and directly. Second, I propose a white bar on the exposure compensation dial, indicating more intuitive and faster to see the neutral position. This design has already been used in the 1970-ties by the Olympus OM2 camera. I have added already such additional markings to the X-E1, 2 and X-T1 bodies I am using, see Fig. 4. 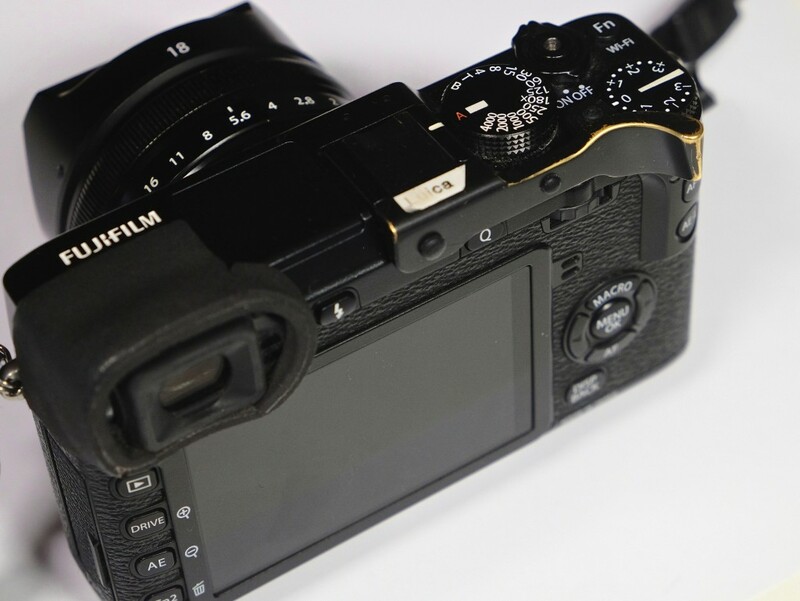 Third, with the next firmware update (Nov. 2015), Fuji will make the X-T1 red movie button a normal programmable Fn button. My suggestion: Why not implementing a colored marking (red, blue, green etc.) to the various programmable fn buttons? Such colors can be then implemented in the Fn menu settings as well. Fourth, as you can see on Fig. 4, for better handling I am using a lot a „thumbs-up“ or „thumb rest“ accessory at the X-E2 body. And also the X-T1 benefits in a similar way. 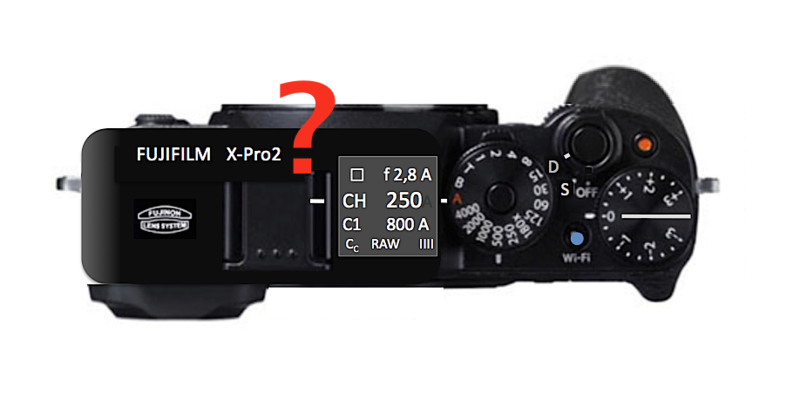 So Fuji, why not designing the X-Pro2 backside with a much more pronounced „thumb rest“ from the very beginning? Or make it a Fuji accessory which can be fixed to the body without blocking the flash shoe. This are my thoughts about possible advancements around the user interface of a new Fujifilm X-Pro2. I know, I do not touch here so many other interesting questions, as there are a new X-Trans Sensor and his performance potential etc. Here, other blogs like Fujirumor.com may disclose more details in the weeks to come … and they say the new X-Pro2 will be announced officially Mid January 2016. We will see. Good thoughts Luica, although I don’t know if any will be seen on the XP2 🙂 The only one I would add is an indicated HFD – Hyper Focal Distance. This would show on your display at teh focus distance plocation, but would indicate always the depth of field. This would not require any complex math really, just a look-up table for each lens with its corresponding aperture and focus distance data. Street shooters would love this as it gives them this info for the lenses that do not have it printed on them. So, with you example above intstead of 1,5 m it would say 1,4 – 3.9m. provided such a small display is designed to handle it. Without much faster and more reliable AutoFocus(especially in low light) it won’t be worth getting. A provision to set a lens at infinity without any problems will help a lot. Thinking stars, auroras and moonlight work where the AF doesn’t work well at all. Much better battery life in sub zero(f) temperatures. Having to change out batteries within 10-35 shots in 20 below zero, blowing wind and snow – just doesn’t cut it. The X-Pro1 is nice but AF and low battery life pushed it to the sale barn for me. My personal experience in sub zero conditions with an X-E2 were very different. At the Ice Harvest I describe how cold and how long my battery lasted. Have alook if you like, and keep in mind that depending on how you use, these cameras have plenty of battery life. A top LCD screen goes against the philosophy of the X-Pro1. I think it is more probable to see a proper ISO wheel beneath the speed wheel. Thanks for yr comment. OK, could be more probable. According my understanding a mechanical ISO wheel (X-T1) finds its limitation when it comes to variable Auto ISO implementation (see X-T10, Q-Menu). I am thinking the X-Pro product philosophy should say first: have more readable settings (not only for ISO) plus direct control plus reduce battery consumption. And then question only second: implement it either by LCD or as you say with an mechanical dial.